The removable lid cap allows you to store your contact information or tube storage details for easy identification. 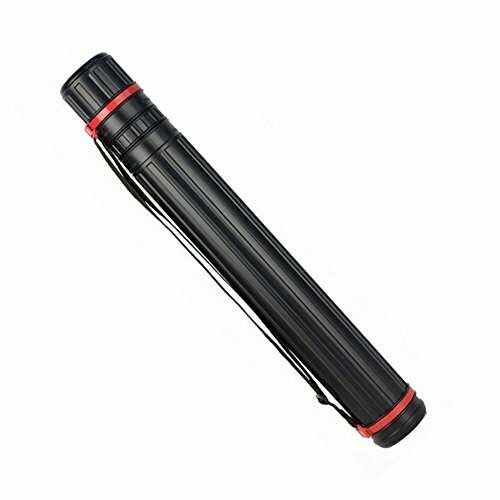 The screw on cap with a tight seal makes Document Tube both water and light resistant. This tube is made out of a very durable plastic, and is not "flimsy" in any way. The document tube is perfect for posters, art work, drawings, blueprints, maps, arrows, large photos, vintage posters, etc. Dimensions: diameter: 8cm/3.15", Length expands from 64cm/25.20" up to 108cm/42.52". Designed for anything that can be rolled, document tube is perfect for posters, art work, drawings, blueprints, maps, large photos, vintage posters, etc. Perfect for Artists, Illustrators, Architects or Hobbyists. Makes for an excellent gift on any occasion! Drawing Storage Plastic Tube with a Lace. Color: Metallic Gray - Extendable Length 27" to 43" / D 3.5"